The mission of Harvard Business School is “We educate leaders who make a difference in the world.” I wanted to tie the mission of the school into a social campaign to demonstrate the impact the students, staff, faculty and alumni will or are making a difference on campus and across the globe through innovation, intellectual ambition, internationalization, inclusion & integration. We also created 2 sets of school-branded whiteboards that ask users to fill in the blanks either “I will __________________ to make a difference in the world.” or “I am __________________ to make a difference in the world.” We brought these boards to events on campus, snapped photos of the participants, upload them to Instagram and pushed to Twitter and Facebook. PDF versions of each sign were uploaded to the campaign landing page to encourage students, staff, faculty, alumni, and other members of the HBS community to download the signs, fill them out, snap a photo and upload to Twitter or Instagram using he #HBSdifference hashtag. 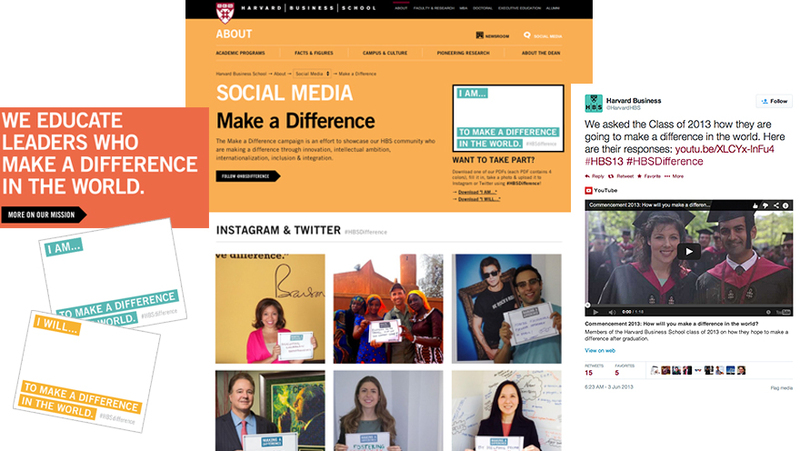 All #HBSDifference posts are aggregated on the landing page.